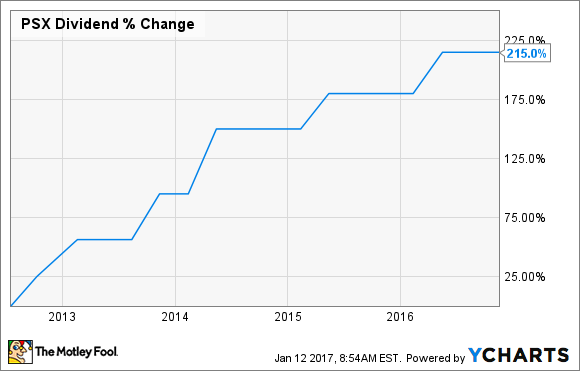 Will Phillips 66 Raise Its Dividend in 2017? The diversified energy manufacturing and logistics company has an impressive dividend growth streak to keep alive. Refiner Phillips 66 (NYSE:PSX) doesn't get enough credit for its ability to pay a compelling dividend. With a current yield of 3%, the company's payout is well above the market's average. Furthermore, the company has a history of increasing that payout each year, which is something I fully expect to see it do in 2017. Phillips 66 has only been a public company since 2012, when it was spun off from exploration and production giant ConocoPhillips (NYSE:COP). However, since that time the refinery owner has increased its payout six times, including a 12.5% boost last May. As that increase suggests, these have not been token raises just to keep the streak alive. Overall, the company has delivered a 33% compound annual dividend growth rate, driving the payout up more than 200%. PSX Dividend data by YCharts. These increases are part of the company's commitment to maintaining a "growing, affordable, and competitive dividend," according to CEO Greg Garland. While that pledge alone would suggest that the company will boost the payout again in 2017, the company has several catalysts on the horizon to back up that desire. In Phillips 66's third-quarter earnings release, the company detailed its progress on several major projects. In the midstream segment, the company expected to complete work on its Freeport LPG Export Terminal by the end of last year and finish the expansion of its Beaumont Terminal by the middle of this year, while a joint venture building a major oil pipeline in the Bakken should enter service later this year. Meanwhile, its CPChem joint venture plans to complete construction on a major Gulf Coast petrochemical complex by mid-year. Finally, its refining segment had completed a debottlenecking and yield improvement project at a refinery during the third quarter and expected to finish a project to increase Canadian crude processing at another plant by the middle of this year. With the roll-off of that slate of major projects, Phillips 66 should experience a significant increase in free cash flow in 2017. Not only will capital expenditures decline, but cash flow should increase as these projects start commercial service. In fact, the company has already announced that its 2017 capex budget will be $2.7 billion. That is down from the $3 billion it expected to spend last year, which declined from the initial plan to spend $3.9 billion as a result of project cancellations and deferrals, as well as the impact from project financing. In addition to the improving free cash flow because of these project completions, Phillips 66 will likely bring in extra money from additional asset drop-down transactions with its MLP Phillips 66 Partners (NYSE:PSXP). The two companies have completed several transactions over the past few years, with the most recent occurring in October. In that deal, Phillips 66 Partners acquired $1.3 billion of assets from its parent company for $1.1 billion of cash and $196 million in units. Given Phillips 66's large and growing midstream segment, it has plenty of MLP-eligible assets that it can drop down to Phillips 66 Partners and bolster its cash position. Aside from the project roll-offs, the other reason why Phillips 66's capex budget will be lower this year is a result of the company's disciplined approach to capital allocation. According to comments by CEO Greg Garland in the capital budget press release, the company currently has fewer projects that "meet our return thresholds in the current business environment." Because of that, the company will have more capital to allocate elsewhere, including the potential to "return significant capital to shareholders" in the form of share repurchases and a growing dividend. Given the company's commitment to its dividend and the looming completion of several major projects, the odds are excellent that Phillips 66 will raise its dividend this year. While it is anyone's guess how much it will increase the payout, another double-digit boost does seem likely because of the expected improvement in cash flow this year.